This is a very rare Valje bongo. Sometimes called the "Concert" model due to the extended shells. This bongo is in excellent condition. No repairs or cracks. The chrome is clean. All parts are original. Made from red oak. Even the sticker is completely intact. This bongo has a great old school sound, dry, with a lot of volume and it is a pleasure to play. 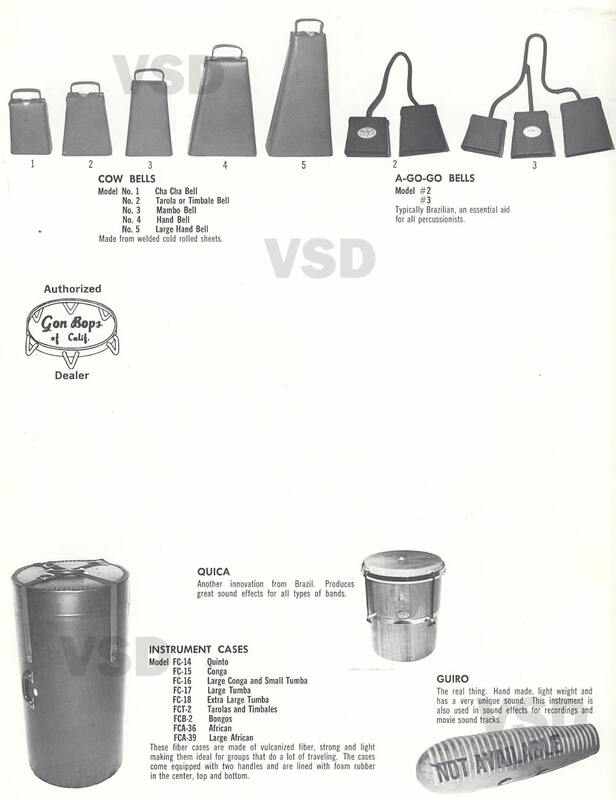 This model was known to be the favorite of famous bongocero John "Dandy" Rodrigues Jr.
Only Valje ever made a bongo like this and not many were made. A great bongo for a player or a collector. This drum was made sometime in the late 60's or early 70's. This model Valje is rarely seen for sale, especially in this condition. 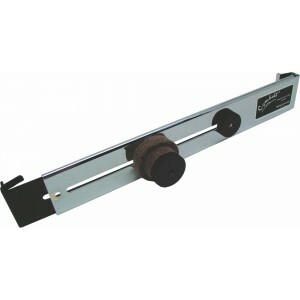 The macho is 7 1/2" and the hembra is 8 1/2". Both shells are 7" deep. This is a no reserve auction. The highest bidder will get this unique and remarkable instrument and piece of percussion history. EBAY AUCTION FOR VALJE BONGO! I almost forgot I had this; a very insightful interview with the one and only Jay Bereck of Skin on Skin from 1999.
a set of Skin on Skin congas made for me by Jay Bereck. Don't tell anybody, but many practitioners of Santeria, the West African religion, purchase their batas (Nigerian two-headed drums) from a Jewish artisan in Crown Heights. 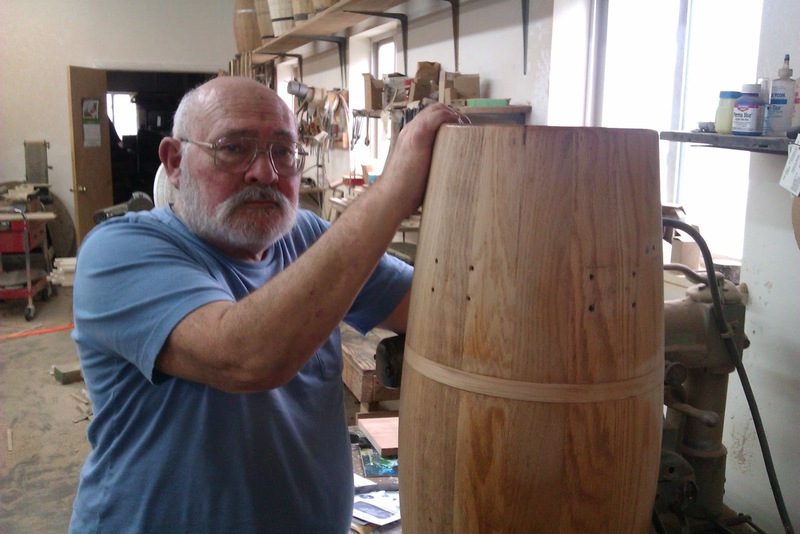 "It's almost sacrilegious to reveal that, but, yes, I make the ceremonial drums," said Jay Bereck, who has been handmaking congas from scratch for some of the world's greatest Latin jazz percussionists for most of his 61 years. "And I didn't have to leave Brooklyn to do it." Born in Williamsburg and raised in Borough Park, Bereck never imagined that his hobby would become a full-time career. Back in the '50s, he imagined he would spend the rest of his life toiling as a sheet-metal worker, manufacturing congas in his spare time, and playing his creations in his East Village mambo band. "The only Hispanic thing about me is my wife," said Bereck, who recently celebrated 38 years of marriage to Maria Migenes, a nurse of Puerto Rican descent. "It was unusual to see a Jewish guy into Afro-Cuban rhythms, but that was the only kind of music that meant anything to me." 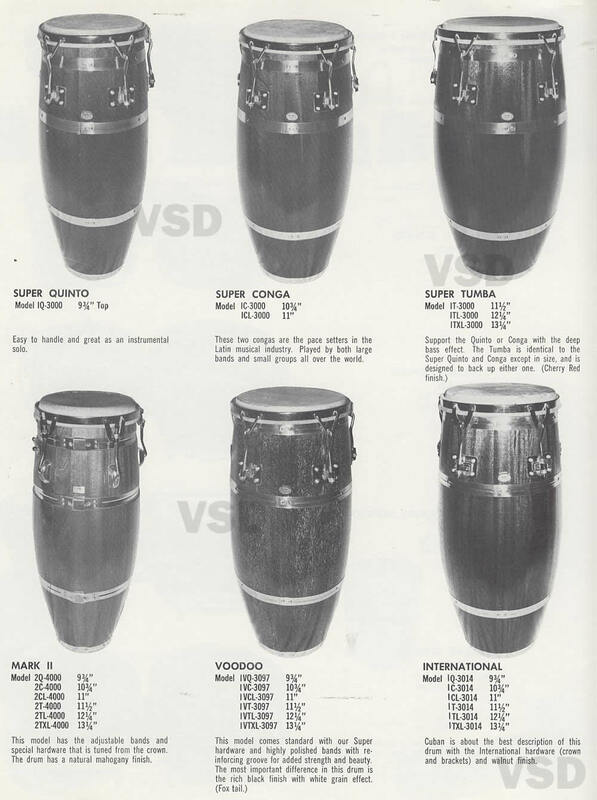 Bereck got into making congas because he didn't like the quality of the congas that were out there. And he learned how to make them by the book literally. "I studied history books, examined their construction, experimented, took them apart, fixed them," he said. "Then in the '70s, while there was a lapse in the construction trade, I started to take on lots of orders to make congas, bongos, batas and before I knew it, I was doing it full-time." Short, stocky and covered head to toe with sawdust, the chain-smoking Bereck is reminiscent of Ernest Hemingway with his white beard and love of Cuban culture. "I'm a meticulous slob," said Bereck, pointing out his file system: a steel door with the names and phone numbers of his clients scrawled in black marker. Bereck's list ranges from Afro-Cuban legend Mongo Santamaria to lesser-known artists from Switzerland, Nigeria, Japan, Greece and Sweden. Bereck's door is one of the many things that adds to the atmosphere of his funky workshop, Skin on Skin, which takes up the entire top floor of a warehouse at 1678 Atlantic Ave. Everywhere you step and look are planks of ash and folds of rawhide ready to be cut, stretched, hammered, screwed, fitted, sanded and polished into congas, batas, and bongos. "People think I'm making a fortune here. Ha! Check this out," Bereck said, jerking his thumb at a tattered price list taped to the wall: congas range from $320 to $385; batas from $295 to $335. Sunset Park's Willie Martinez, a percussionist for the Ray Santos Orchestra, has purchased congas from Bereck for the last 20 years. Martinez calls Bereck the Stradivarius of the conga. 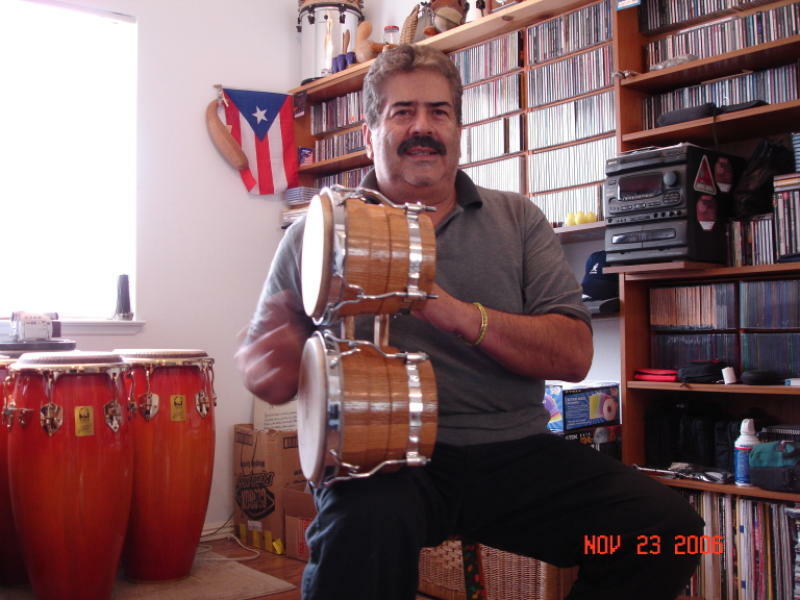 "Jay's congas produce voices that you cannot get from mass-produced congas," said Martinez. "With Jay's congas, when you strike the center skin, it produces a rich bottom sound a deep bass moan that sounds just like the handmade congas made in Cuba." Bereck said that he and his assistant, Amilcar, make at least three congas per week. "I want to raise my prices, but conga players remember their poverty for too long," said Bereck, who said that if it wasn't for his wife's income, he would have had to close his workshop 25 years ago. "Congeros are not violinists. They don't pay thousands of dollars for their instruments nor would they if they could," Bereck said with a laugh. My favorite conga for rumba! I have been lucky enough to own several excellent drums, and played on many more. Ritmo by Matt Smith, Skin on Skin by Jay Bereck, Moperc's by Michelle Ouelett, Isla by Mario Punchard, LP, Gon Bops original and new, some old Cuban drums. However, the drum I enjoy most, my very favorite drum for rumba is this old Valje tumba produced sometime in the 1960's by Tom Flores with this excellent skin by LH Percussion. This drum just has a beautiful tone, not too dry, not too wet sounding and can be played as loud or as softly as you want. I can tune it down or up and it still sounds great. The best thing about this drum though, is it's bass tone, it can be heard and felt whenever it's played in rumba, this drum gives that bomba that BOOM it needs to really push and drive the clave. I love it. I got this drum from a friend in Berkeley a few years back. I remember him mentioning it was a little big for him to comfortably play and he preferred his other drums, so I made him an offer and he bit! he's right, it is a big drum, 31" tall, 12 1/4" at the head. I believe this Valje's large size is what gives it the incredible bass tone it has. I got very lucky with the skin, not too thick to choke the bass, not too thin to sound ringy, it is soft to the skin and responsive to the touch. I also really enjoy the look of this drum. 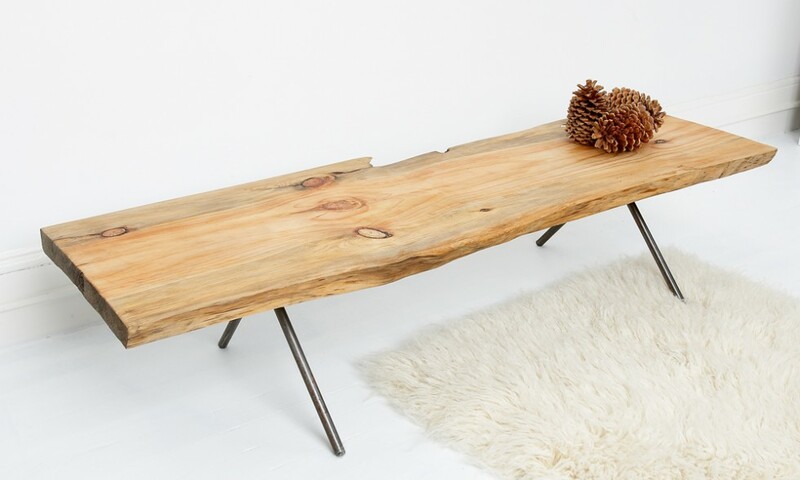 Made in another era, the red quarter sawn oak just has a character of grain you can't find anymore. This Valje has a few scars here and there, and I've had to repair a couple cracks, but it has been solid now for a couple of years. I had new lugs made by Ralph Flores at Resolution drums, as the LP lugs that were on it just did not look right I don't baby this drum, I use this drum for public rumba and playing outside in the park. I play it hard and I am not afraid to hit the skin or sides of the drum with sticks. I've got a another Valje from the 60's I pair up with this drum and my Sol quinto rounds out this rumba set. As beautiful sounding set of congas as you will ever hear, made right here in California. Like I've said, I've owned a lot of nice drums but this one is staying with me. 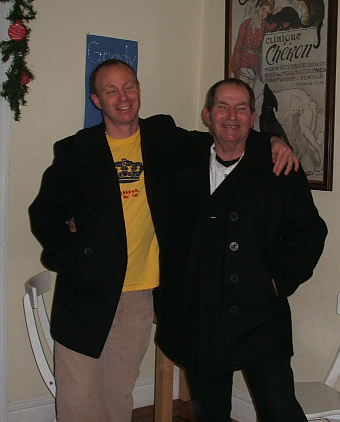 My dad played guitar all his life and was quite good at bluegrass finger picking style and folk guitar and played Bob Dylan tunes. When my Dad was about to retire I took him shopping for a new Martin guitar as a retirement present, because he said he always wanted one. In conversation, he mentioned he had this little Martin guitar, but it was broken. When my Dad first move to California, he bought this guitar in a pawn shop in L.A., he played it for a while then the bridge pulled off. So he put it in the attic for 30 years or so. I climbed up into the attic and pulled out the guitar. I took it to the best luthier in San Francisco and got it fixed for my Dad. He was able to play it for a couple of years before he died. Last February it needed another repair so I brought it back to SF. I visited my Dad in October, and he asked me to bring the guitar so he could play it one last time. It sounded great. When I left he told me to take the guitar, it was mine now. My Dad died two weeks later. It's a very valuable guitar and is worth a lot of money, but the guitar will never be sold. I don't play guitar, but I am sure one of my nephews or nieces will, or their kids, and the guitar will eventually belong to one of them. I am lucky enough to know several excellent guitarists. A guitar needs to be played, among my friends there is an open invitation to play my Dad's little guitar. I will enjoy hearing the guitar played and having the sound of it bring back memories of my Dad and his music. The venerable conga makers Gon Bops have a rich history and have made their impact on Afro-Cuban percussion both here in America and worldwide. 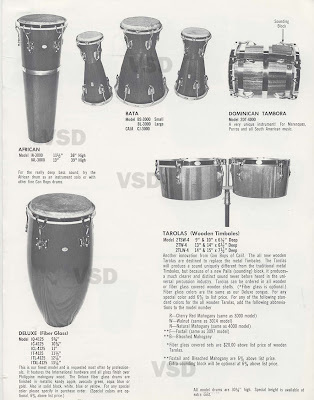 Long before the mass produced instruments of Latin Percussion / LP, Gon Bops of California were making great quality instruments from the 1950's on to the 1980's. The sound of Gon Bops have graced many a street corner rumba and are heard on numerous recordings; Funk, R&B, Disco, Rumba, Soul, the sound of Gon Bops can be heard in many styles of music. Today original Gon Bops are sought after worldwide for their unique sound. That so many are still available is a testament to their enduring construction and authentic sound. I am fortunate to live in California where many vintage Gon Bops can be heard, seen and played. I've been lucky enough to have owned several Gon Bops of different sizes and styles and eras and to have played on countless other Gon Bop congas of all types. Today I own two Gon Bops congas: a vintage IQ-4125 quinto with Deluxe hardware and one of the newer DW Gon Bops "super" quintos. Both are lovely drums. 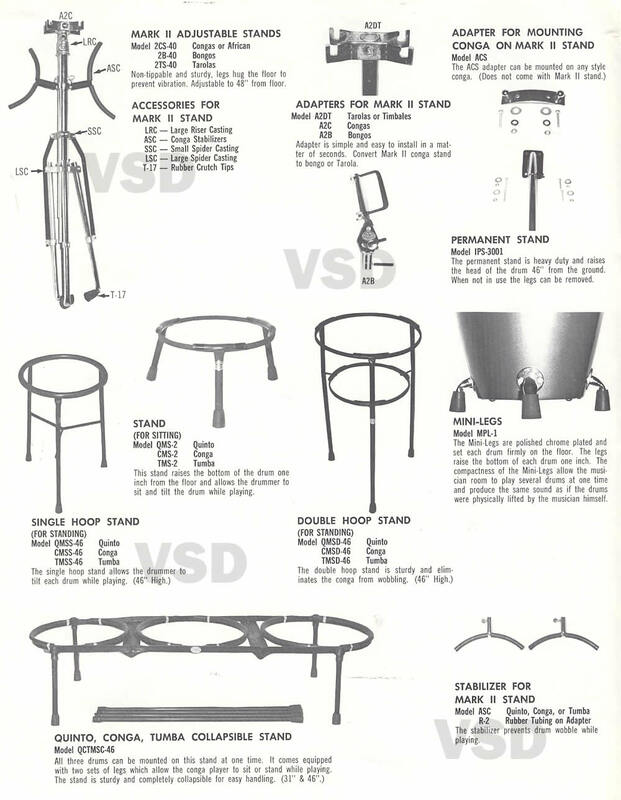 Vintage Gon Bops come in a variety of hardware models and shell construction. 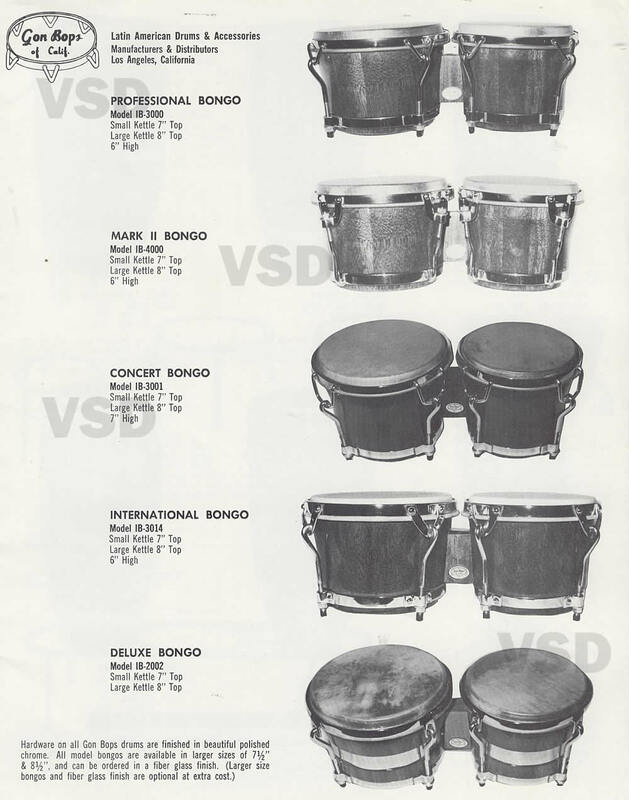 I have collected a few pages of an old Gon Bops catalog and I am posting them here as a resource for congueros wanting to know more about their vintage Gon Bops drums and for percussionists looking to make online purchases of vintage Gon Bops congas and bongos. 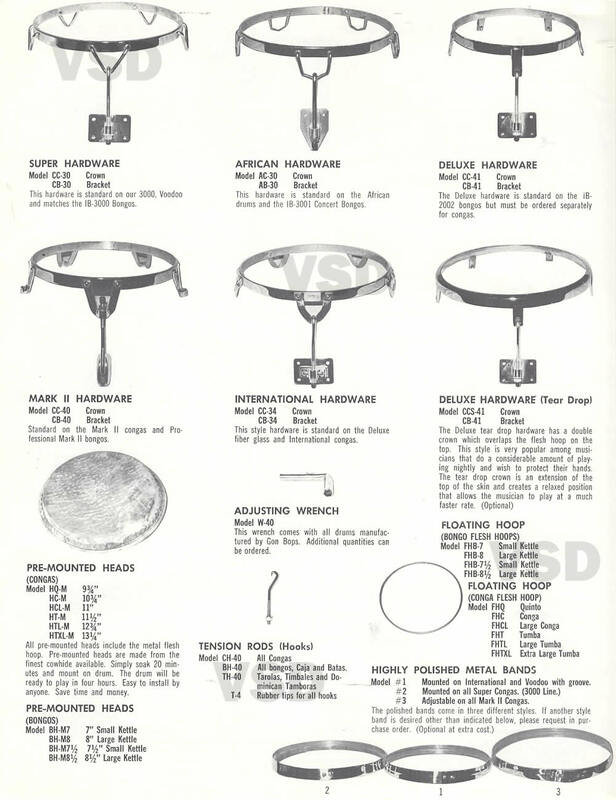 A Tale of Two Ludwigs: A Bass Drum Story. 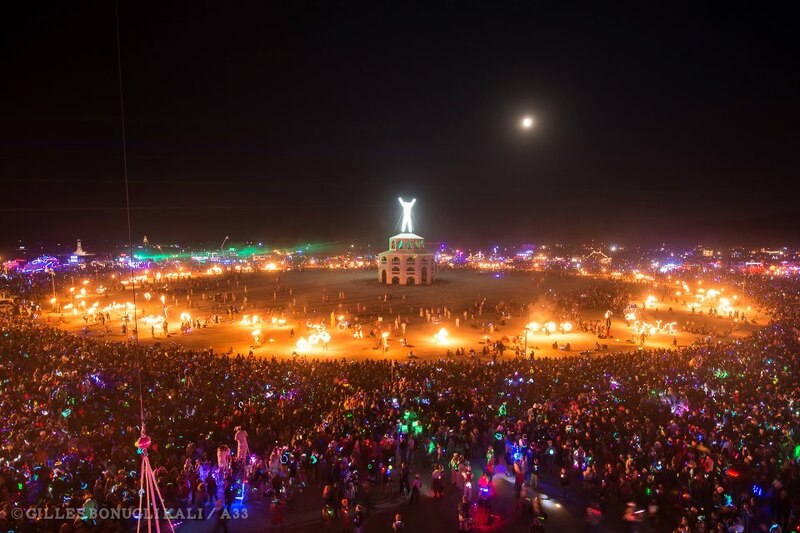 Well it's been a busy couple of months, I guess it all starts with getting ready for Burning Man! Last year I went to Burning Man and was a part of the Ambient Drummer's Collective. The Ambient Drummer's Collective is a group of drummers and percussionists that accompany groups of Fire Dancer's that play just before they burn The Man. Last year I brought my La Playa conga which a friend had given me for free. It was light and already kind of a beater drum, so I would not have to worry about it getting banged up, dusty or even burned! Well the burn was really exciting and a great event. I actually led a group of drummers, about 8 in all. I had so much fun I signed up to do it again this year. However this year I was looking for more chances to play. There are very few rumbas if any at Burning Man, and I'm not much into the drum circle thing, but I did notice that there were a couple of marching and samba bands. I had played orchestral percussion in Junior High where I learned to play timpani, snare drum and bass drum. Snare drum takes a lot of technique, but bass drum not so much, so I went and bought myself a bass drum on Ebay for $100. The drum I got was a 24" Ludwig marching bass circa 1980's. When it arrived it was a bit more scratched and scraped than the photos showed, several of the lugs had been changed, there were brand new ones, old ones, some original ones and some vintage ones, kind of a Frankenstein of a drum. I could deal with all these things, but then I noticed the cracks in both hoops! Not cool. I emailed the seller about the damage and asked for my money back, and they offered me a partial refund, we settled on a 50% refund. Now I was feeling good as I had a functional drum to play AND a drum refurb project for $50. I always say, I love tinkering on drums almost as much as playing them! 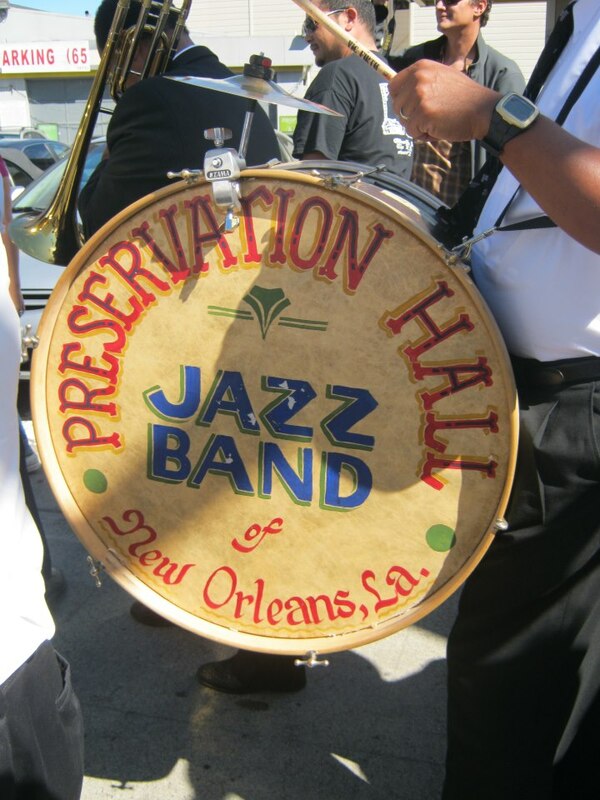 This new project also gave me the chance to research marching bass drums, particularly those from the New Orleans Second Line tradition. Apparently in that style the bass drummer mounts a cymbal on the bass drum! Excellent! Now not only did I have a drum project I had a wonderful new esoteric and obscure drum project! And lucky for me I was able to get a glimpse of such a drum first hand as the Preservation Hall Jazz Band were in town for the inauguration of the Preservation Jazz Hall West here in San Francisco. This was a fun little design challenge, the more I looked the more it seemed that every drummer had a different method of attaching the cymbal to the bass drum. Luckily I have the excellent Sam Adato's Drum Shop. I make sure and go to his shop every now and then. I picked up a sweet Zil-Bel bell for a fraction of what they go for a while back and he has the best sticks for playing guagua/cata/palitos. Anyways, Sam hooked me up with some nice pieces of hardware to mount the cymbal to the drum. Well the white wrap on the Ludwig shell was a mess so I decided to replace it, but when I took it off I saw the drum was made from a nice Maple ply, so instead of a new wrap I stripped the old wrap from the shell and the black paint from the hoops and left them a natural wood color with a simple finish of clear ployurethane. Next I drilled a hole for the cymbal hardware, and the drum was ready for Burning Man, and looking pretty good too. 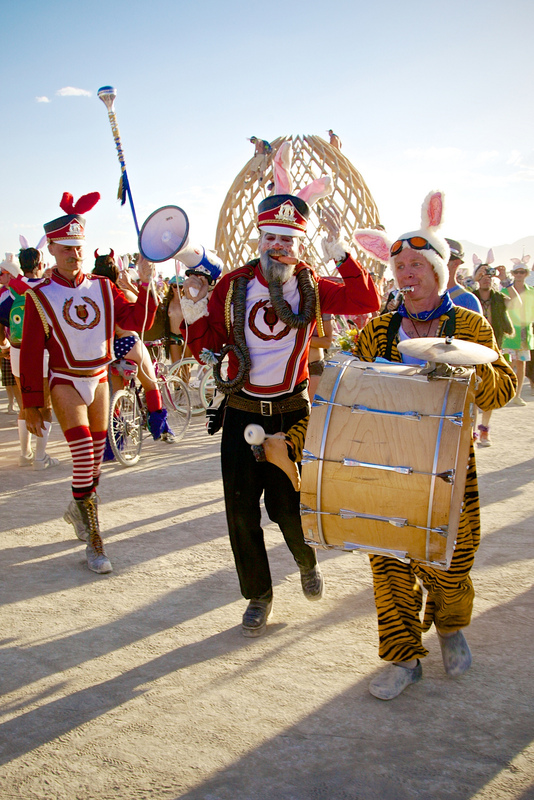 So I was off to Burning Man with my $50 dollar Ludwig! I had contacted a couple of the marching bands and had several gigs lined up. The best two ended up being Mardi Gras at a very large theme camp called the French Quarter and the other was a whimsical event called The Billion Bunny March, where burners dress like bunnys to protest humanity and "The Man". 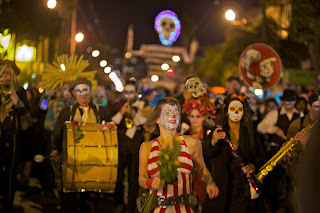 At Mardi Gra at the French Quarter I went as a member of The Burning Band which is the longest running marching band on the playa and famous for their flaming tubas! This was a great gig, with a full band and an audience of around 300, with lots of people coming and going. The New Orleans brass band style of music really added to the atmosphere of the camp and the French Quarter folks were very appreciative. My next favorite gig was the Billion Bunny March. I went there after the meeting for the Ambiance Drummer's I mentioned previously. I was very touched at the Ambiance Drummer's meeting. I offered to lead a group again. After I introduced myself and did a little audition, I got more people asking to be in my group than last year and more than any other group leader. Not only that, but two drummer's from last year's burn joined my group again. Anyways, after the meeting the Billion Bunny March meet up spot was right around the corner. So I took my drum, put on my bunny ears and started playing along to the music. Just as the march started the two leaders came over and said to me "You're leading the march!". I am? Well okay, let's go! So that was Burning Man and my Ludwig bass drum. The best $50 drum idea I've had! So when I get back, I'm taking a day off and just browsing through the Craigslist Ads and I stumble upon this ad selling several marching bass drums from different manufacturers and of a variety of sizes, models and ages. 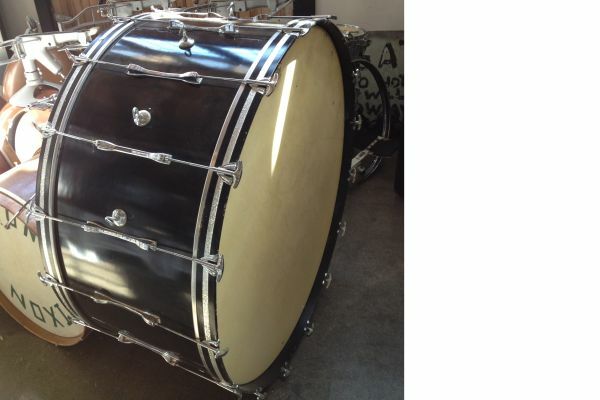 I looked through the pictures and saw something that caught my eye; a large vintage bass drum in good and complete condition. 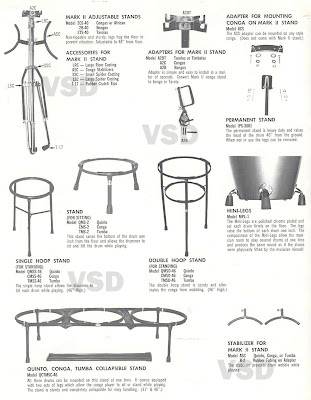 Anyone that is into vintage drums knows they just don't make them like they used to and that is because they can't, The types and quality of woods just aren't available like they were 50 years ago. 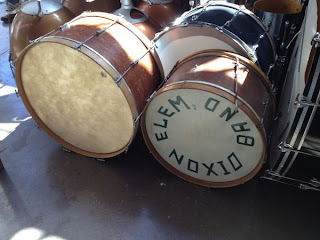 Seems like a very cool furniture design studio called Ohio Design right here in my neighborhood of The Mission in San Francisco had bought several drums from Dixon Elementary school, and right there in the photo above is the drum that caught my eye. Among other drums they were selling was this 40" orchestral bass drum, which I admit tempted me, but my apartment is just too small for a 40" drum! But the 28 incher, that I could handle. I made the call and went on over to Ohio Design. As an architect I was impressed with the quality of their furniture designs and the wonderful atmosphere of their old Mission District warehouse studio. I looked over the drum and it was in better condition than I had hoped, no cracks and all the lugs were present and straight with very little rust. A little haggling and the deal was done; sold for $80 with no shipping or waiting, what a deal! A little digging around on the vintage drum forums and I'm able to date this drum to the 1950's. It turns out this drum is a WFL Ludwig with a 3 ply mahogany shell with thick reinforcing maple rings at the bearing edge and with maple hoops. Even though this drum is 28", because of the wood types and construction it is lighter than my 24" maple Ludwig. The drum was in great shape but it did have one torn head and the other head was for a timpani and not a bass drum head. Well when you get an old drum the choices are; do nothing and leave it alone, refinish it and keep the patina intact, restore it to as close as original condition, or refurbish it with some modification. I figured I already had a light colored drum with the 24" maple Ludwig, so I decided to do something different with this drum. I chose to stain this drum a darker color to contrast with my maple bass drum and also to highlight the wonderful art deco stylings of the metal lugs. I stripped the drum of it's old finish, applied several coats of Watco Danish Oil to the shell and stained the hoops darker. Finally I applied a gloss polyurethane coat to the hoops for additional protection. I rubbed the metal down a bit, but decided against polishing it too much, as I liked the grey matte color. Finally I ordered some new Remo Powermax heads. I think the drum came out really beautiful. And it sounds phenomenal; a deep dry bass thump! The oil really brought out the color of the mahogany. The matte oil finish of the shell is a nice contrast to the glossy rims and the dark stained color of the rims really highlights the floral shape of the lug hooks. When I ordered new drum heads for the 28" Ludwig I decided I might as well order new heads for the 24" inch Ludwig. Actually, when I was refurbishing that drum I was influenced by the appearance of Keith Frazier's drum. Keith is the bass drummer for the Rebirth Brass Band. Keith uses a beautiful wood finish bass drum with black heads for a very striking appearance. 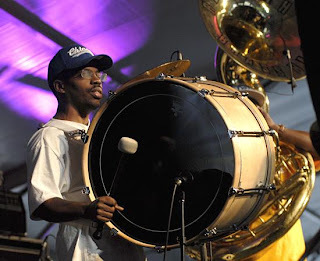 I recently saw Keith Frazier and the Rebirth Brass Band perform here in San Francisco and I was able to ask him about his drum as I didn't recognize the manufacturer or model. Keith Frazier told me that he made it. Apparently Keith Frazier put his bass drum together himself! So the maple Ludwig got some nice black REMO Powermax heads as a kind of homage to Keith Frazier and the beautiful drum he has made and the music he makes with it. 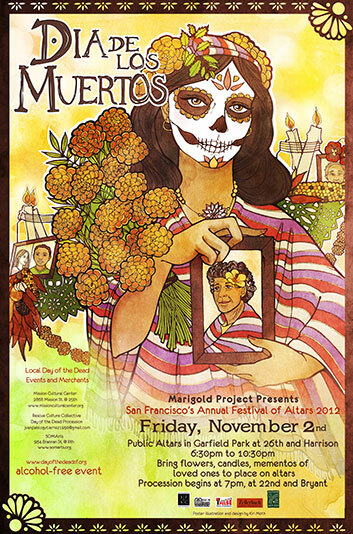 Well in the meantime I had organized a band to play at San Francisco's Dia De Los Muertos celebration, an event I had played rumba at for two years previously. 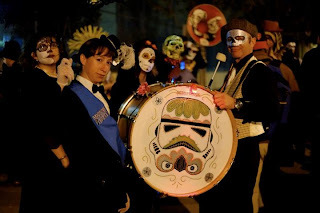 We always played rumba in Garfield Park where the altars for the dead are, and I hadn't yet joined the procession, so this year I formed a marching band to play in the procession jazz funeral style. 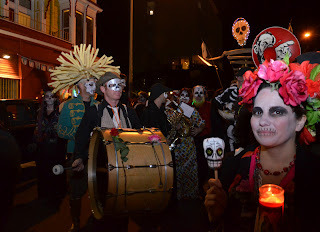 Since I had bought new heads and would be replacing the old heads the maple drum came with I decided to decorate the old heads in the tradition of Dia De Los Muertos, but I gave it a twist....one of the songs my band was going to play was Chopin's dirge, you know, dun dun dadun dun dadun dadun dadun. Well that song reminded me of the Imperial March from Stars Wars...so we decided to play that too. As I was studying the Star Wars song, I remembered seeing art where a Stormtrooper helmet was decorated like a sugar skull. Sugar skulls are the theme for Dia De Los Muertos, so I painted a large Stormtrooper "Sugar Skull" on one of the drum heads. Now I was ready for the procession. I managed to get around 15 different horns and a couple of percussionists, several of whom I had met at Burning Man, with three musicians traveling up from San Diego to play. 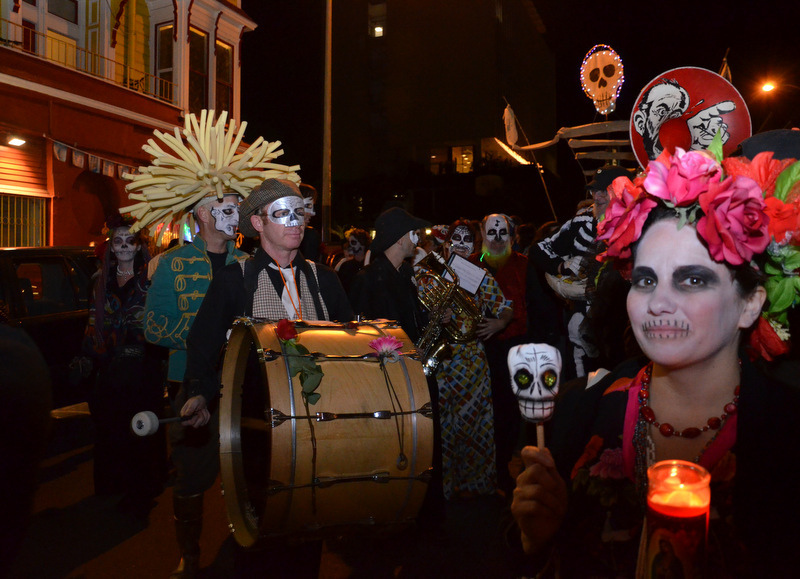 I did miss playing rumba with the rumberos this year, but being in the procession with a marching jazz funeral band was awesome! The band all came out in costume and the crowd loved us. I'm sure we played for at least 2,500 people that night with a huge crowd following the band and dancing with us for several blocks. This drum was also an altar, I had some mementos and belongings from two of my friends that had passed away, KC Mitchell and Lisa Forman, attached to this drum. Well the procession ended and I had some shiny new heads to put on my drum. Did I say I liked tinkering with my drums almost as much as playing them? Well the very next day the 24" Ludwig got the shiny black heads, and it looks great! I don't care if I am copying Keith Frazier! This drum looks hot. What I really enjoy is having the 28"drum and the 24"drum looking like opposites of each other, the vintage 28" has a classic look with dark wood and traditional white heads and the newer 24" drum has modern look with a blond wood finish and black heads. Eventually the 28" drum will get a cymbal too, but I'm saving up for one of Frank Epstein's "Cymbelts" because the 3 ply mahogany shell is not quite robust enough to mount a cymbal by drilling a hole in the shell in the same way as my 24" Ludwig's maple shell. One thing that has struck me through playing this new instrument and learning about the musical culture and tradition of Second Line percussion and jazz marching bands in New Orleans is how similar the tradition is in many ways to the Comparsa in Cuba and Samba in Brazil. Of course a little research begins to show how and why they are connected. I'm currently reading a few books and articles on the subject, as well as comparing the rhythms of the three styles. I hope to be writing a more scholarly post soon on The Similarities of Samba, Comparsa and the Second Line soon.